Equine sports massage is the therapeutic application of professional sports massage techniques applied to the horse. A thorough understanding of anatomy and the interaction of bones, joints and muscles are the basis of the proven physical and mental therapy that is the art of massage. 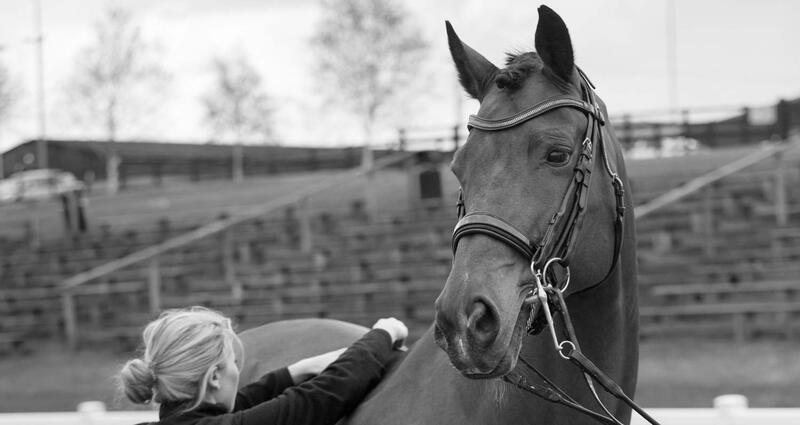 A masseur looks at the horse as a whole and attempts to consider all possible causes and effects of any tension while interpreting a horses reactions and expressions. All of the above can be signs of pain and discomfort and should be investigated. Used during training and pre and post competition massage keeps muscles healthy, builds up those that may have wasted, maintains strength and suppleness and prevents atrophy even during a period of box rest or restricted work. After exertion massage minimises stiffness and speeds repair to tissue damaged as an inevitable result of physical stress and fatigue. Passive stretches help to keep or restore joints and muscles to full working capacity. Massage can benefit the well being of the animal, release tension and aid mental relaxation. In the event of an Injury, massage is of great benefit to aid recovery and prevent atrophy (wasting) of muscles. To understand why we need to know more about muscles, is that more than 60% of the horses body weight is muscle. Small muscle injuries can take up to 90 days to become apparent (by a change in attitude, decreased performance and lameness) by which time they may have caused more serious injury. Prompt attention to these ‘minor’ muscle injuries not only enhances a horse’s performance but also may prevent future problems. Muscle tightening is transmitted from one muscle group to another, so for example, shoulder tension may be transmitted to the muscles of the forearm, resulting in extra stress being placed on the tendons. Muscle may also enlarge with tension.